B. 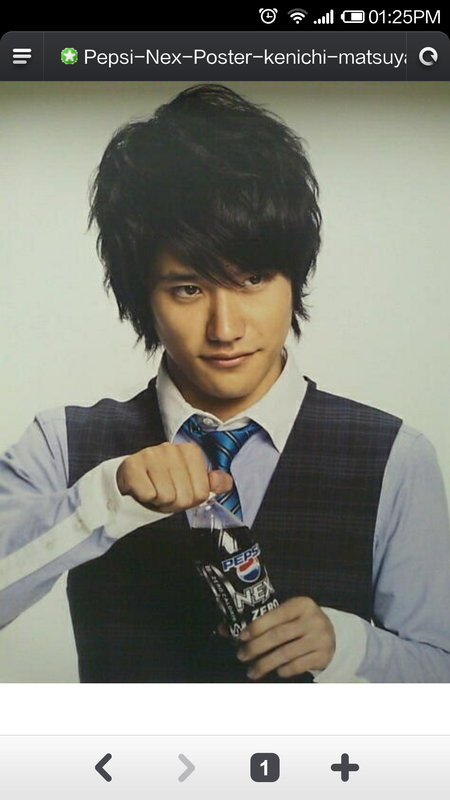 さあ….まつやまさん な かわいし、けっこ だ し、 はんさむ な おとこ の ひと だ し。 uhmm..Because Matsuyama is cute,wonderful and a handsome man. i-adjective ‘ Kawaii ‘ became ‘kawaishi’. Replace last i with shi. Because he is cute. na-adjective ‘kekko na’ became kekko da shi. Replace na with ‘da shi’. Because he s wonderful. Also a reason ending in desu, will result to desu becoming dashi. Like for the example above , ” hansamu na otoko no hito desu” became ”hansamu na otoko no hito da shi” . Because he’s a handsome man. One day I started watching Breaking Bad Season 1 and now I can’t stop. I’m now a new fan of this awesome series. It was about an overqualified chemistry teacher who , after being diagnosed with lung cancer, decided to be a meth cook so that he can leave a fortune for his family. So as I was searching fan arts and discussion forums for this show, I found this picture. 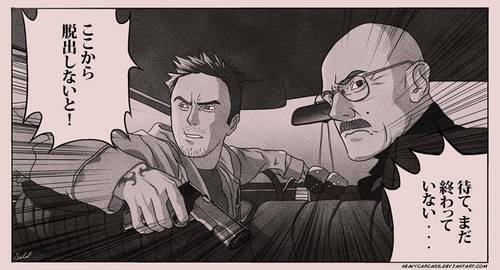 This is a panel from the “Breaking Bad” manga version. I grinned and said “Nihongo Exercise TimE!!!! I couldn’t read some of the Kanji. I seeked help of MaggiSensei. Now I learned something new! How about you? Can you read it? If not, here’s the answer. New Kanji! Unlocked with the help of jisho.org! Every year, Japan Foundation conduct a Nihongo Speech Contest for non-native speakers in our country.It usually happens during February. The winners will be rewarded with a one-week all expense paid trip to Japan. My friend and I joined this year. Unfortunately, we didn’t qualified. Nevertheless, it was fun. We experienced writing a speech and translating it to Nihongo. That was no easy task! We asked for help from many people. We even contacted some of our Japanese friends who can speak in English and even they, themselves, had a hard time. It was not easy because its not only the meaning that should be translated. There were also tone, formality, the choice of words. And not only that, we also need to recite our speech the Japanese way. Yes! That was the hardest part. I haven’t speak Nihongo that long. I don’t know where to cut the sentences, the right intonation, the right pronounciation of Japanese words. Regardless, my friend and I still submitted the requirements including the cd which contained the recording of our speech. We didn’t pass as I mentioned. But we learned a lot from this experience. Next time we will be wiser! I decided I will be posting my Japanese Speech here. This is about why I think Anime is Japan’s greatest gift to the world. If you want to hear the recording of my Japanese voice, (ahem! if you’re interested), you can hear it here from my personal blog. Nihon ga sekai ni ichiban hokoreru monowa nan desuka? Jidousha? Denshi kiki? Soretomo sushi deshouka? What is Japan’s greatest gift to the world? Automobile? Electronic gadgets? Sushi? Minasan sorezore chigau mono o kotaeru koto deshou. Moshi watashi ga kono shitsumon o saretara, watashi wa ‘Anime!’ to sokutō suru deshou. Different peole would have different answers. Without thinking for a second, my answer would be “Anime”. Watashi nitotte muzukashii shitsumon wa ‘doushite?’ to kikareru koto dake desu. The harder question for me is “Why?”. Mukashi, haha to terebi no chan-neru arasoi o suru tabi ni, haha wa itsumo onaji shitsumon o shite kimashita. Several years ago, my mother often asked me this question whenever we fought over television channels every night. [Nande anata wa sonna ni anime ga sukinano? Tadano e janai no! ]- Okotte iru haha no hana no ana kara wa, kemuri ga mokumoku to deteiru youni miemashita. “Why do you like anime so much? It’s just drawing! ” She would say angrily I could see smoke coming from her nose. Ikura demo kotae ga omoi ukabi mashita ga, kekkyoku nanimo iimasen deshita. Just when I thought I have thousand answers, I couldn’t say anything. Watashi wa juu-issai no toki, totemo mono shizuka na onnano ko deshita. When I was eleven years old, I was very quiet. Demo, Hajimete mita anime “Yu yu hakusho” ni hitomebore shite, ookiku kawari mashita. But it changed when I fell in love with my first anime “Yuyu Hakushu”. Anime o mita sono hikara, shizuka datta shoujo wa ichiban sawagashiku natte shimatta nodesu. Because of it, I started topping the list of the noisiest students in the class. Sawagashiku suru seito niwa, kyoushitsu o souji shitari, yuka ni wakkusu o kaketari to itta, batsu ga arimashita. There were punishments awaits for the this kind of students like cleaning the classroom and waxing the floor. Shikashi, sore wa watashini totte, nanno mondai demo arimasen deshita. But for me, it was okay. Muchuu ni nareru monoga aru watashi niwa, batsu nante nanno mondai demo nakatta nodesu. I guess if you are truly excited about something for the very time, it was all that matters. Koushite watashi wa tsuini shin-yuu ga dekimashita. This way, I finally met my bestfriends. Kanojo tachi to wa, itsumo kyoushitsu o ittari kitari shite imashita. They were just across the classroom all this time. Iroiro na anime ni tsuite hanashi o shite, noto niwa anime no kyarakuta o kaitari shimashita. Sore ga mitsukatte, okorareta kotomo nandomo arimashita yo. We talked about anime a lot, drew in our notebooks and at the end of the class, we get punished. Watashi tachi wa, sorekara juunen rai no tomodachi desu. Since then, we became friends for more than ten years now. Watashi tachi wa, anime o miru koto de, sainou o saihatsuken dekimasu. Watching anime help us to rediscover our talents. Manga o kai tari, fikushon o kai tari, kotonaru shumi o motte imasu. We engaged in different hobbies like drawing manga style and writing fan fictions. Demo kosupure wa ichiban daisuki desu. But I like “cosplaying” the most! Kosupure wa itsumo atarashii sukiru to sōzō ryoku ni charenji deki masu. Cosplaying always challenged us to learn new skills and be creative. Soreni ta no anime ga suki na hitobito to ureshii kioku o tsukuri mashi ta. Moreover it gave us happy memories. Kyonen, Firipin no Handoredo Airanzu ni itte, kishi de wanpīsu no kosupure o shimashita. Just like last year, when we went to “Hundred Islands” of the Philippines, we cosplayed “One Piece” characters at the shore. Shiroi suna to aoi umi ga arimashita. Rufi san to tomodachi wa umi no kaizoku desu kara, kakkoii to omoimashi ta. We thought it was cool because Luffy and his friends were sea pirates. Shashin o totte iru to, kankoku no ryokō kyaku ga wakuwaku shi nagara ki te, issho ni shashin o torimashi ta. While we were taking pictures, Korean tourists excitedly approached and asked to take pictures with them. Kankoku go wa wakaranakutemo, onaji ai o motte iru kara, issho ni ite tanoshikatta desu. Even though we didn’t understand Korean, because of our common love, we had fun together. Anime o miru koto wa watashi ni iroiro na yume o ataete kuremashi ta. Watching anime gave me different kinds of dreams. Samurai ka tantei ka ninja ka meka no pairotto, mahōtsukai nado ni nari takatta desu. Samurai or a detective or ninja, mecha pilot or a mage, I had wanted to be all of these..
None of them ever came true. Dakedo, hitotsu dake kanae rareru yume ga arimasu. But I know there is one dream I know I could achieve. Sabutaitoru nashi de anime o mitai. I had a desire to watch anime without subtitles. Itsuka, nihongo no honyaku sha ni nari tai desu. Sō sure ba. Anime o rikai dekiru. Soshite, seikaku na imi o tsutae tai. Someday, I would like to be a nihongo translator so I could understand and then share an anime to the world as truest to its message as possible. Sorekara dabun…dare ga shite ‘ru? Itsuka suki na animētā no Miyazaki-san ni aeru kamo shire nai. I might accidentally meet my favourite animators like Hayao Miyazaki. Moshi hanaseru kotobaga “Konnichiwa!” dake dattara watashi wa koukai suru deshou. I would truly regret if all I could just say is “Konnichiwa!”. Kono Kimochiga arukara kono shunkannimo watashi wa jyunbiwo shite imasu! I have this feeling I have to be prepared for a moment like this! My heart is filled with gratitude. Subete no nippon no ātisuto ni. Watashi tachi ni anime no sekai o motte ki te itadaki arigatō gozai masu. To all Japanese artist, thank you for bringing us the world of anime. Sore wa watashi o kara tokihanachi, shinyū tachi to meguriawase te kure mashita. Soshite watashi tachi no kokoro ni yume o atae te kure mashita. It helped me to go out from my shell, meet my bestfriends and gave passion in our hearts. Anime no okage de, watashi tachi wa taisetsu na omoide o tsukuri mashita. Because of anime, we created priceless memories that we will treasure forever. Dakara anime wa Nihon no idai na okurimono desu. That’s why for me, it’s Japan’s greatest gift to the world. Dakara Anime wa Nihon no sekai ni ichiban na hokureru mono desu. Saidai no okurimono de, shin sedai o kobu shitsuzukeru koto ga dekimasu. May you continue to inspire new generations with your greatest gift. 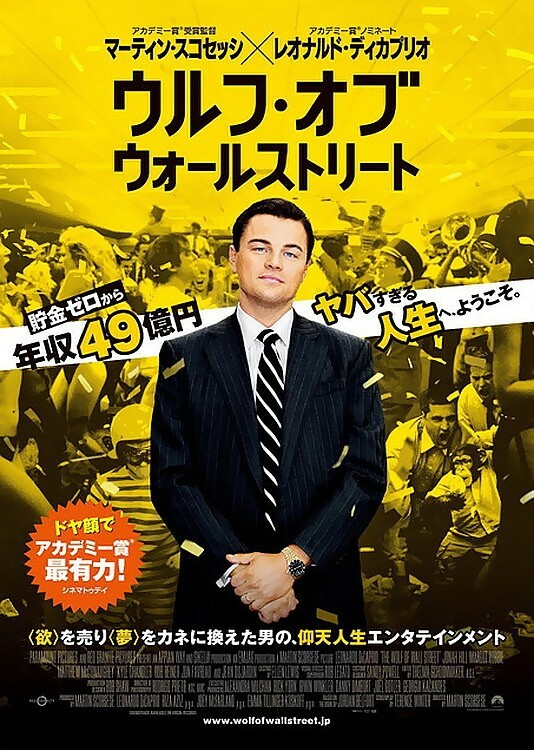 I read that the movie “Wolf of Wall Street” premiered on Japan. Along with the article is the Japanese version of the poster. I was happy because it’s fun reading the Katakana in this poster. How about you? Read it too as an exercise. I will post the answer at the end of this entry. I just thought that this is worth sharing. I created this blog to document my journey in learning Nihongo. If you read about my “About Page”, you will know it became not easy for me. I will post it here in this entry since I might change it. Hi! i’m Meari, that’s not my exact name. My goal this year is to pass JLPT N5 exam this coming December. Hopefully I’ll pass. Honestly, there’s a tragic story behind this exam. I actually took it last December 2012. I didn’t fail it. I was disqualified to take the exam. All because of a rule that I didn’t follow, I didn’t turn off my cellphone. Yeah, i’m stupid. I didn’t take it seriously. I didn’t know what’s the matter with me. Maybe because of lack of sleep due to a nocturnal job. It just happened. I was happy shading answers, my phone rang and I was kicked out of the room. I was deeply discouraged. I honestly think of not pursuing it anymore. But then I still love Anime, Jpop, RAMEN, Eigasai and Japan toy cameras. It’s still my dream to go to Japan and meet Kenichi Matsuyama(He’s married hu hu hu) and Satoshi Tsumabuki . I also want to land a job as a translator. So I decided to pull myself together and pursue it once again. I will be wiser this this December. And yes! I took the exam last December 2013 and the result came out last January 30. And yes, I passed! Now I am ready to learn Nihongo in whole new level. I am going to enroll for Intermediate Japanese in a national university. So I guess, I have new mission this year! JLPT N4, you got to be ready for me! 1. Ame ga futtara,ikimasen. if it rains, I will not go. 2. Ame ga futtemo, ikimasu. Even if the rain falls, I will still go. Usage: The use of “te+form verb + mo” here is to express “Even if” but also located at the end of the conditional clause. So for this example, if you translate it literally, “rain falls even if”. No matter what happens, even if it rain, he still would like to go. This is expressing extreme determination. 1. Kimura-san wa watashini nekutai o kuremashita. Kimurasan gave me a necktie. Syntax: Giver + wa + Receiver + ni + object o kuremashita. Usage:This is how to express someone giving an object to to other. Kuremashita translates to “gave”. It is actually has the same meaning with the word “agemashita” which is the past tense of ageru/agemasu. The only difference is you will only use kuremashita when you or one of your family is the receiver of the action. For example, if you want to tell Kimura gave a necktie to your sister. That would be Kimura-san wa imoto ni nekutai o kuremashita. But if you want to tell that Kimura-san gave a necktie to someone else let’s say a person named Tanaka, that should be Kimura-san wa Tanaka-san ni nekutai o agemashita. This is actually a matter of showing politeness. Kuremasu is like showing that the giver is on higher status than yourself. This is elaborately explained in this site. 2. Watashiwa Kimura-san ni kasa o kashite agemashita. I lend an umbrella to Kimura. Syntax: Giver + wa + Receiver ni +object o +action to give in te-form, agemashita. Usage: This is like a more caring or polite version of Watashiwa Kimura-san ni kasa o kashimashita. Basically, the meaning is the same. But putting te-form verb + agemashita is like saying ” I humbly lend my umbrella to Kimura because he really needs it. I’m really concerned that he might get sick.” I might be exagerrating but “agemashita” here is putting a “concerned” tone to the sentence. 3. Watashi wa Suzuki-san ni Nihongo o oshiete moraimashita. I received Nihongo teachings from Suzuki/ I had Suzuki to teach me Nihongo. Syntax: Receiver wa + Giver ni + object o + verb 0n te-form + moraimashita. Usage: This is the way to express “receiving” putting the receiver as the subject of the sentence. Just like the opposite of the first example. If you would take the giver as the subject of this sentence, this will be Suzuki-san wa watashini oshiete kuremashita. 4. Kanai-wa watashi ni kodomo no shashin o okutte kuremashita. My wife send me a picture of our child. Syntax: Giver +wa +Receiver ni + object o + te-form verb kuremashita. Usage: Again , kuremashita is used in giving which I/the narrator is the receiver. This is different from number one in such that this time, the object is an “action” rather than a thing like a necktie. The object here is okutte, a te-form of okurimasu which means “send”.